During my sophomore year I took a biweekly OHG Ancient World History course, which was taught by my dad, Jim Bizer. 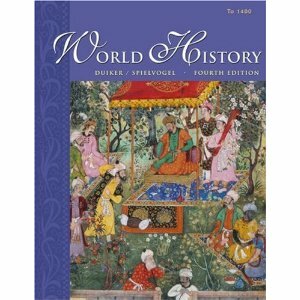 For this class we used the the first half of the World History fourth edition text book by Duiker and Spielvogel. The class ran through both semesters. Between each class meeting we would read and take notes on our next chapter; sometimes we would spend more than one class covering one chapter depending on its length and subject. Also, as past of our assignment we would take a fifty question chapter assessment test. We would bring our tests and answers to class and my dad would grade them. I would go back and study areas of the chapter that I got questions wrong on. In class, we would review the main topics from the chapters and then open up a discussion about what we found to be the most interesting or surprising thing we had learned. Each student had to contribute at least one specific personal idea or opinion in these discussions. We would also talk about parallels we see between current society and the history we were studying. There was also a paper and presentation project that each student complete. I wrote my essay about the Neolothic Revolution, which was the time in history that humans created the first civilizations and began using agriculture. I class, along with the other students, I gave an aural presentation of about this topic and used photos, charts, and other visual aids in the presentation. I have included the my essay at the bottom of this page. Also, for this course I began working on a large and very in depth research about the end of the Mayan civilization. After doing my initial research for this project, I decided delve deeper into the subject, which I found incredibly fascinating, and I completed the final paper at the beginning of the following school year. I have included that paper into 2010-2011 history section. By thoroughly taking notes and analyzing the textbook, completing the assignments and project, and participating in class, I gained a lot of knowledge about ancient world history. I learned specifically how ancient societies and peoples developed, functioned and often failed. We covered the dawn of human beings through the Neolithic period, early Mesopotamia, Egypt, Greece, Rome, China, Japan, Southeast Asia, early americas (Maya, Inca, Atzec, and North American peoples), Africa, the Mangols, and Europe generally from the Vikings to the Middle Ages.